Alabama HB 56: Which Way Will The Ruling Lean? After hearing three legal challenges, federal judge Sharon Blackburn gave mixed signals on how she might rule on Alabama's controversial immigration law. On Wednesday, at the Hugo Black courthouse in Birmingham, Alabama, federal judge Sharon Blackburn and approximately 200 others in attendance heard a full day’s worth of arguments to determine whether Blackburn should enjoin Alabama’s controversial immigration law, HB 56. The proceedings lasted longer than expected as a result of the judge’s decision to hear jointly all three legal challenges to the law—by the Department of Justice, an alliance of civil and immigrants’ rights groups, and a group of Alabamian bishops. At day’s end, it remained unclear how the judge would rule, but she did provide certain clues to how she was leaning on certain key issues. • specific items, like criminalizing the solicitation of work, violate freedom of speech under the First Amendment. 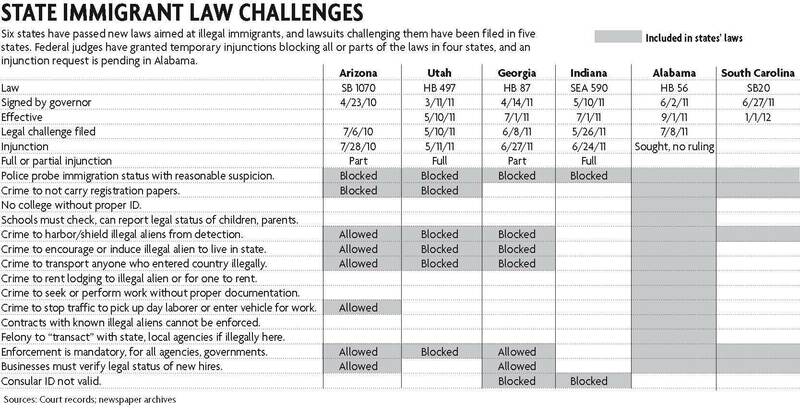 As this useful graphic from The Birmingham News shows, HB 56 goes further than Arizona’s SB 1070 and the copycat laws in three other states that have already been partially or fully enjoined. It is thus very likely that the judge will block at least part of the law, so the real question is: how many of the law’s provisions will she leave untouched? Judge Blackburn, an appointee of George H.W. Bush, asked tough questions of both sides, but she took a much tougher line with the plaintiffs than other judges who have ruled on similar cases, such as the recent hearing on Georgia’s HB 87. For instance, though she reiterated that she had not made up her mind, Judge Blackburn repeatedly remarked that the bishops’ challenge to the law was weak. In response to their claims that HB 56 would criminalize their church’s ministry to the immigration population (such as transporting and caring for indigent people), she said, “In my view…a very, very, very high percentage of the things they write about simply aren’t covered by the statute…I just don’t see it.” She also expressed sympathy for other arguments from the state of Alabama regarding whether federal law pre-empted certain sections of HB 56. On the bright side for the plaintiffs, Judge Blackburn did indicate particular concern about the constitutionality of the provisions requiring local law enforcement to take a direct role in immigration enforcement, noting concerns that the law was pre-empted by federal law and could raise serious Fourth Amendment concerns. And she showed perhaps the greatest sympathy for the plaintiffs when it came to their challenge to the requirement that K-12 students and their parents demonstrate their immigration status, indicating that the plaintiffs had a strong argument that this section amounted to an equal protection violation that could deter parents from sending their children to school. How Judge Blackburn was leaning on the broader questions of whether sections of the law—or the law in its entirety—are pre-empted by federal law remained less clear. The judge gave both sides more leeway in these arguments and reiterated that this was a complex issue that she would need to consider further. Given the sympathy Judge Blackburn demonstrated for certain arguments from the Alabama state attorneys, it’s hard to imagine that she will enjoin the whole law. It also seems improbable, given her expressed leanings against particular provisions, that she would allow the legislation to stand in its entirety. Assuming that a partial injunction comes down next week, the question for groups on both sides of the fight in Alabama will become how to respond to the ruling. For the plaintiffs, a partial injunction would be enough to claim victory, as they have done in similar cases, such as Arizona and Georgia. National civil and immigrants’ rights advocates—like the American Civil Liberties Union, Nation Immigration Law Center and Southern Poverty Law Center—would then have to prepare for the next round of appeals. Meanwhile, grassroots and advocacy groups in Alabama like the Hispanic Interest Coalition of Alabama (HICA), Alabama Appleseed, and Greater Birmingham Ministries will need to determine their next steps. In recent months, these groups—under the banner of the Alabama Coalition for Immigrant Justice (ACIJ)—have held rallies, marches and vigils in response to the law and are planning a large rally for September 1st, when the law is scheduled to take effect. But the challenges of organizing recent immigrants in the conservative Southeast, where many live in fear and resources for grassroots organizations are relatively scarce, remain daunting. One new development in recent weeks has been the emergence of a new group of undocumented immigrant youth, which has held a mock graduation and a five-night vigil outside the Hugo Black courthouse. Still, it remains to be seen if and how they will be able to sustain and expand these efforts and whether they will integrate their efforts with groups under the ACIJ umbrella. Unfortunately for Latino and immigrant rights’ advocates, a partial injunction could also embolden the restrictionists who have promoted these laws in Alabama and around the country. One HB 56 sponsor, Republican State Senator Scott Beason, sat calmly near a group of undocumented students yesterday during the hearing; he and his allies are unlikely to be deterred in their efforts to target Latino immigrants. Moreover, a partial injunction could work for restrictionists’ broader national legal strategy. All along, groups like the Federation for American Immigration Reform (FAIR) and its legal arm, the Immigration Reform Law Institute (IRLI), have launched a spaghetti-on-the-wall approach—advancing as many restrictionist provisions as they can to see which will stick. Including many provisions, of course, provides immigrant advocates with more opportunities to attack new state laws, and perhaps strengthens the case for enjoining a law like Alabama’s in its entirety. But, assuming a judge issues a partial rather than a full injunction, the sheer volume of provisions targeting undocumented immigrants in laws like Alabama’s leaves open the possibility of more controversial pieces sneaking through the courts. Ultimately, restrictionists like Beason hope that the Alabama court will uphold certain key items. Following any injunction, the state would almost certainly appeal the ruling to the conservative 11th Circuit, which recently ruled against the individual mandate provision in President Obama’s healthcare bill. By getting certain provisions through Judge Blackburn’s court (and possibly through the appellate court), restrictionists at groups like FAIR—which has been deemed a “hate group” by the Southern Poverty Law Center for its ties to white supremacists—and IRLI would have a stronger case that five federal lower court rulings have conflicted on similar state bills. Ultimately, restrictionists hope that confusion among the lower courts on such a hot-button issue would raise the likelihood of the issue reaching the Supreme Court, which in fact recently upheld an Arizona law (separate from the SB 1070 challenge) to withhold licenses from businesses who hire undocumented workers. The restrictionists may therefore have good reason to find their chances with the court’s conservative majority appealing. However the judge rules in this case, the fight over legislation targeting undocumented immigrants in Alabama is far from over. HB 56 has already begun—and will continue—to have profound implications for undocumented immigrants and U.S. citizens in Alabama, and Judge Blackburn’s preliminary injunction ruling will set the stage for the next round in the national legal fight over restrictionist state legislation. *Daniel Altschuler has written extensively on U.S. immigration politics for publications including the Christian Science Monitor, The Nation, CNN, and Dissent. He holds a doctorate in politics from the University of Oxford, where he was a Rhodes Scholar. To read more of his writing, visit danielaltschuler.com.